Posted on Thu, Oct 8, 2009 : 8:45 a.m.
Irving Feller was in the middle of his residency in the 1950s when two young patients were admittedÂ to the University of Michigan HospitalÂ with relatively minor burns. Days later, both were dead. “Burn treatment wasn’t popular. The mortality rate was very high, and the patients took a lot of time to heal,” Feller said. 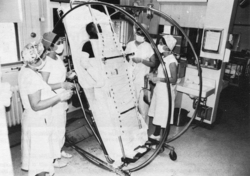 It was that disturbing trend that led Feller and a team of health care workers to assemble one of the first centers for treating burn injuries in the United States in 1959. 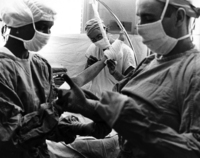 U-M’s Trauma Burn Center was born from that effort andÂ is celebrating its 50th anniversary today. A reception and presentation, along with tours of the burn center, are being held this evening at U-M’s Towsley Center to commemorate the milestone. Today, U-M's burn center is a world-class trauma burn center and is the state's burn coordinating center, said Stewart Wang, the current director of U-M’s Burn Center. The burn center is a Level 1 Pediatric and Adult Trauma Center and a Burn Center verified by the American College of Surgeons. It has about 10 intensive care unit beds and six step-down beds specifically devoted to the center. It's staffed by a mix of about 300 nurses, physicians and therapists who help treat patients. "It's a huge team. That's what a burn center is," Wang said. Feller traveled to a couple hospitals around the country that had fledgling burn treatment programs and were themselves looking for ideas. Shortly after he returned, a young girl who was about 10 years old was brought in after her clothing caught fire. She’d been burned over 56 percent of her body. Feller asked for responsibility to care for her. That didn’t usually happen, he said. He soon got help from a long-time nurse who took special interest in the young girl and began working extra hours to care for her wounds. Others from different specialties pitched in with her treatment - for the first time, a systematic approach to her treatment was used and included a therapy of antibiotics to fight infections, along with regular bandage changes and physical therapy. The young girl became the first person to survive after suffering from that degree of burns. The creation of the burn program grew into its own unit at U-M and eventually led to the creation of the first intensive care unit at the hospital. It fostered the start of burn treatment partnerships between other local hospitals and the weekly burn seminars, which helped start the American Burn Association. Feller said it also led to research into effective burn treatment and prevention efforts, and to self-published literature about effective ways to establish a burn treatment program at a hospital. 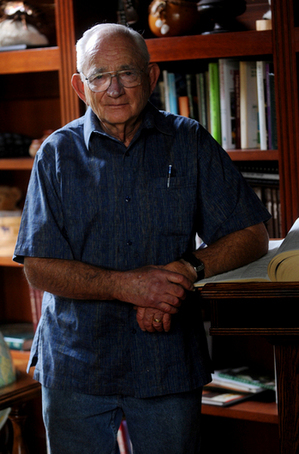 Feller was contracted to help start burn centers at hospitals across the Great Lakes region and served as director of the center until 1990, when he retired. In 1986, U-M created a new burn unit. In 1991, it expanded to become the U-M Trauma Burn Center to handle all burn and trauma cases as the hospital. According to the American Burn Association, there are about 40,000 hospitalizations in the U.S. for burn injuries every year. More than 60 percent of those cases are admitted to the 125 hospitals that have specialized burn centers. The prominence and challenges of burn wound care have changed markedly in recent years, Wang said, particularly in the post-9/11 world where terrorism is a threat all burn centers must prepare for. In the attacks that occurred in Madrid, Spain, and London in recent years, 30 percent to 40 percent of injuries included significant burns, Wang said. Even situations like industrial explosions require a response to mass burn casualties, he said. "How do you handle that? How do you prepare a team for that?" Wang said. "The new world is one where we have to think about that." Today, Wang said he is impressed to see how many more similarities than differences there are in burn treatments, modeled after Feller's work. For instance, modern burn treatment relies on improvements in the understanding of what's happening at the cellular level when a patient is injured. But the systematic approach to pulling together a team of experts from different disciplines is still central to the treatment of burn wounds. A focus on reducing preventable infections and preventing burn wounds in the first place is still central to the burn center's mission. “He was a visionary, he really was,” Wang said. "Things we're doing are things that he got started way back then." Tue, Jun 11, 2013 : 5:46 p.m.
Tue, Apr 20, 2010 : 8:08 a.m.
Dr. Feller we are very proud and grateful to you for your great lecture at our Burn Center in Bali after the Bali Blast in 2002. We are looking forward to your next visit! Mon, Oct 12, 2009 : 7:29 a.m.
As a burn victim that benefited from the U of M Burn Center in 1987, I would like to thank Dr. Feller and all of his staff for getting me through intensive care and rehab in just 12 days after 33% of my body was 2nd and 3rd degree burned. I can just imagine the stories of lives saved and other amazing recoveries here and around the world as a result of this vision! Fri, Oct 9, 2009 : 8:35 a.m.
Thu, Oct 8, 2009 : 3:05 p.m.
Health care is a noble profession. We are blessed in this area with an abundance of fine health care resources. Thanks to Dr. Feller and all those involved in the medical profession. Thu, Oct 8, 2009 : 12:14 p.m.
For Fire Prevention Week, there will be American Red Cross volunteers in Saline and Chelsea this Sunday afternoon distributing fire prevention information. They will be passing out information in Saline Fire Department, 100 N. Harris St., from noon to 3 p.m. and in Chelsea, 200 W. Middle Street, between noon at 4 p.m.
Thu, Oct 8, 2009 : 11:49 a.m.
U of M Hospital is 2nd to none. Thank you to all the healthcare providers at U of M!!!! Thu, Oct 8, 2009 : 9:53 a.m. Many thanks to all who have served their fellow man in the art of healing. Just think all that was accomplished without a federal government program. Thu, Oct 8, 2009 : 6:29 a.m. Thank you Dr. Feller, colleagues, and U of M for your compassionate, committed, diligent, and innovative care of burn patients!